Alliance Rubber Naturewise Cushioned Mailer - #00, 5" Width x 10"
Bubble Mailers offer strong, puncture-resistant air bubble protection. Ideal for mailing pictures, cassettes, jewelry and more. Tough outer layer provides stiffness and rugged durability. Design is lightweight for postage savings and water-resistant. 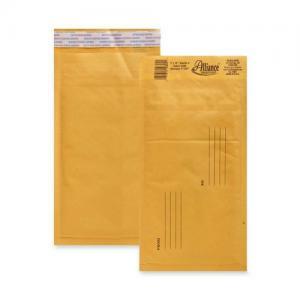 Mailers feature a pressure-sensitive strip closure. Simply peel away liner and seal. Envelopes are preprinted with "To" and "From" address lines. Each contains 100 percent recycled paper.